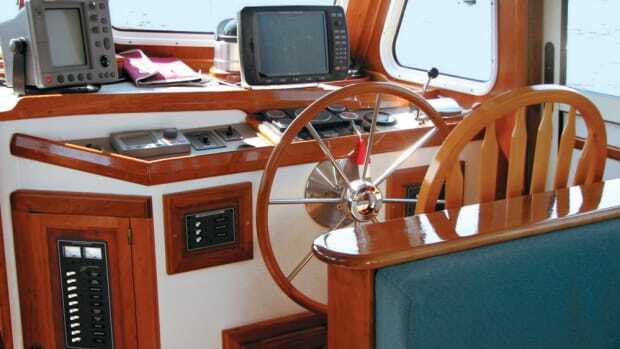 For the past three years we&apos;ve used electronic charting, combined with GPS, for navigation. For instance, on a recent overnight trip from New York Harbor to Chesapeake Bay on Teka III, our 52-foot trawler, we decided to enter Delaware Bay in the wee hours of the morning, in pitch-black conditions. Using our Visual Navigator software and electronic charts, we were able to watch our boat image on the computer screen while maneuvering the intricate channels and turns. Our radar played its part during the passage, indicating large targets, such as channel buoys and tugs towing barges, while the echo sounder confirmed we were in the proper depth for the charted position. We expected our charts to be correct, with accurate bottom depths, channel markers, and buoy placements. Fortunately, all went well that dark night, especially as many commercial ships use this route coming in from, and going out to, the Atlantic Ocean around Cape May, New Jersey. With complete darkness and a boisterous sea, it was indeed a great comfort to be able to not only see where we were on the chart, but also to stay over on the starboard side of the channel, out of harm&apos;s way of commercial traffic. In thousands of miles of cruising up and down the entire East and West Coasts of North and Central America, and to Southeast Alaska, we have usually found nautical charts to be accurate. But we have noticed occasional discrepancies in depth readings and marked locations of shoals, rocks, and wrecks. While we have somehow avoided these uncharted underwater obstacles, it is sadly true that other cruisers, fishing boats, and commercial ships have not. Our dependence on electronic charting for navigation motivated us to learn more about how charts are made. How does information on the chart get there in the first place, and why is it sometimes inaccurate? And what&apos;s in store for all of us in the future? So when we last visited the Pacific Northwest, we decided to visit the NOAA (National Oceanic and Atmospheric Administration) Hydrographic Office on Lake Washington in Seattle. While there, we also had the opportunity to tour its 231-foot hydrographic survey ship, Rainier, moored on Lake Union. During our visit, Captain Jim Gardner of NOAA&apos;s Pacific Hydrographic Branch briefed us on how chart data is gathered and processed. He explained that approximately 50 percent of the sounding data on today&apos;s charts comes from original lead line surveys. Lead lines were manually thrown from a boat until they reached bottom. Marks on the line indicated how deep the lead had gone. These depths were then recorded on a chart, based upon triangulation with shore stations. We asked Captain Gardner how to determine which chart soundings originate from the manual lead line approach, rather than modern electronic survey equipment. If the survey is dated before 1940, it is based on lead line surveys. This data often appears on the chart, but not always, in a straight line, with considerable distance between soundings. Coastal surveys have been around a long time. NOAA&apos;s Office of Coast Survey actually dates back to President Thomas Jefferson, who in 1807 issued an order for a survey of the new nation&apos;s coastline. Lead line soundings performed the duty back then, continuing until 1940, when single-beam echo sounders took over. While considerably better than lead lines, single-beam sounders only show data directly under the boat. Thus, if an obstacle or rock lay 50 feet to port of a sounding vessel making a parallel track every 200 feet, there was no way to know it without hitting it. (See the illustration comparing the three types of sounding methods.) Divers are often sent down to confirm suspicious findings, but vast areas of the sea bottom are left uncharted. One way to deal with this problem, which we encountered in Maine, involves dragging a chain between two boats at a specified depth to insure there are no surprises (rocks, wrecks, ridges) and the water is at least the depth of the chain, such as 10 fathoms. The modern era in depth probing began in the 1980s with the advent of towed side-scan sonar and in the 1990s with multiple-beam sonars. This technology depends on sophisticated computer software and high-capacity computers for processing. This new technology allows survey vessels to cover swaths of the sea bottom 100/1,000 feet wide, depending on depth and bottom type. Such sonar capability provides much more accurate data than ever before. A complete picture of the bottom is now available, as can be seen from the illustration of the three sounding methods on the next page. NOAA, formed in 1970, has an annual budget of approximately $38 million to fund 60/70 new hydrographic surveys a year. Its Hydrographic Division has three major mapping vessels and a huge territory to cover. Each new survey covers an area of about 24 square nautical miles; thus, they can survey around 1,680 square NM per year. This amounts to less than one-tenth of one percent of the 3.1 million square NM that make up U.S. territorial waters. NOAA&apos;s current focus is on 43,000 sq. NM of "critical areas," such as fairways, anchorages, channels, and approaches. With current resources, it will take 25 years to complete these "critical area" surveys alone. NOAA also tries to resolve 100/300 wreck or obstruction reports annually, although about twice that number are reported every year. In addition to the surveying budget, there is an office full of cartographers at NOAA Head-quarters in Maryland who translate the field data into revised charts. At the same time, these specialists update dredged channels, new obstructions, port improvements, buoy changes, and sunken vessels. With this huge task, how does NOAA allocate its limited resources? To support commercial shipping and fishing, of course...not us pleasure boaters. With 98 percent (by weight) of all U.S. commerce transported by water, including 50 percent of all hazardous materials, these activities rate top priority. Obviously, pleasure boaters benefit from the improved charts-if our cruising area happens to coincide with commercial interests. Each year requests for surveys are submitted to the Office of Coast Survey in Silver Spring, Maryland. Each is evaluated and prioritized, then assigned to field units for investigation. The cost of an individual survey varies, depending on where it&apos;s done and how many days are involved in data collection. For instance, a survey in the flat, shallow Gulf of Mexico is much less expensive and time-consuming than the rugged Alaskan coast, where bottom, shoreline, and weather make surveying very challenging. 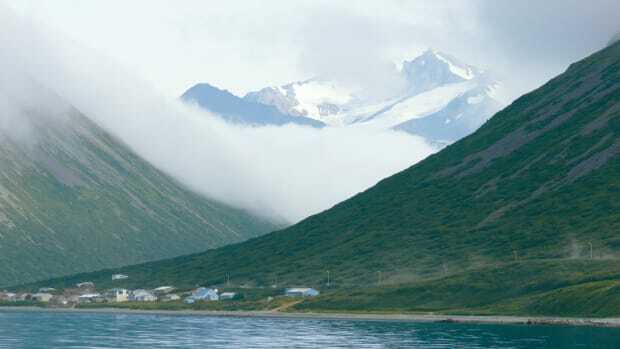 Alaska&apos;s west coast has been the top priority for a number of years. Some areas have never been surveyed, while others date back to Captain Cook&apos;s lead line data of the late 1700s. In addition, the 1964 earthquake shifted the ocean bottom, and even today many glaciers are receding while more and more cruise ships cruise the area. So much work remains to be done, the Hydrographic survey ship Rainier spends most of its summers in Alaska. When we went aboard the 231-foot Rainier, accompanied by Ensign Angie Venturato, we were struck with the number of computers we saw. Most were Windows-based desktop models, the same as what&apos;s available off the shelf to us. In the Plot Room, which serves as a command center for hydrographic operations, field operations officers determine daily work assignments for the survey crews of six aluminum launches. At day&apos;s end, the data from the launches is analyzed in the control center. Most of the survey work is performed from the launches, while the Rainier lies at anchor nearby. The motto of the launch crew: "We hit the rocks so you don&apos;t have to." The launches show much evidence of having encountered rocks and icebergs during survey duty. The launches use multi-beam sonars, as well as towed side-scan sonars, to map a wide path of about 100/1,000 feet, depending on the depth. All objects on the bottom that appear on the screen are noted, and their location and height are later compiled. Differential GPS provides the location for soundings with an accuracy of about 10/15 feet. Temporary differential stations may be set up on shore by the survey team if a U.S. Coast Guard station is not within range. The shore reference stations allow not only accurate depth plots, but also the precise positions of docks, rocks, and headlands. 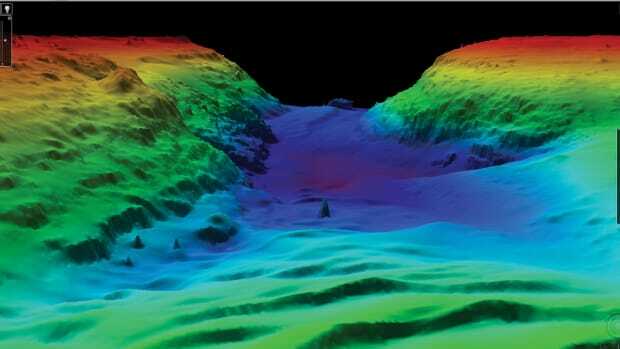 If a rock is not found where an old chart put it, it is marked "disproved" by survey crews. Local tides are also carefully monitored so survey data correctly reflects Mean Lower Low Water depths, rather than simply the depth at the time of the survey. A shore-based tide station is set up, and corrections are made based on actual tidal conditions. To compute the speed of sonar sound through the water, constant measurement of temperature and salinity is taken. All data collected during the day is fed into the main computers aboard the mothership. Corrections are applied for speed of sound, tides, temporary loss of GPS signal, heave, roll, pitch, even draft of vessels collecting data. Then a determination is made where the real bottom is. The data for one field survey sheet may amount to more than 500 gigabytes of computer storage, and it takes many survey sheets to cover a chart area-although only a small percentage of this data is used on the final sheet. The Pacific Hydrographics Branch in Seattle is where art and science are combined, because the enormous amount of data must be made usable and understandable. 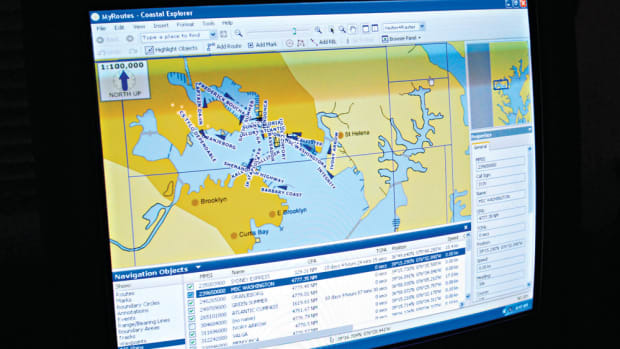 The final step in chart production occurs in NOAA&apos;s headquarters in Silver Spring, Maryland, where all hydrographic data is combined with U.S. Coast Guard navigational aids and U.S. Corps of Engineers dredged channel data. And a new paper chart is born. NOAA also creates electronic raster charts either directly from computer data or by scanning paper charts. 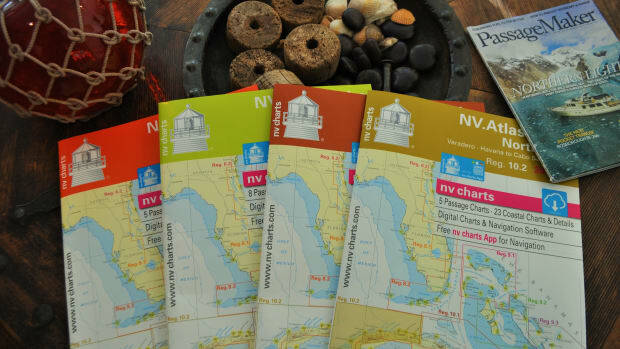 By agreement, raster chart files are given to Maptech (www.maptech.com), which pioneered the distribution system so familiar to boaters-the CDs containing charts for a particular region, such as Chesapeake Bay. Maptech also provides updates and reissues the CDs from time to time. When the updating system is fully implemented, NOAA will send Maptech weekly computer updates that can be passed along to subscribers through their update service. At this time mostly commercial shippers use this service, providing the latest information for ships&apos; navigation computers. Charts are not copyrighted, as they are made with public money. Therefore, anyone can take raster charts and digitalize them. By default, a raster chart is only as good as its original paper chart. Errors carry over. Paper charts have a built-in error rate related to the scale of chart and the accuracy of printing. On a 1:80,000-scale chart, for example, this means shorelines, buoys, or soundings could be off by 80 meters in the real world. Overzooming, or enlarging computer charts excessively, also causes problems by magnifying errors. A mariner may zoom in on his electronic chart, taking it past the original chart&apos;s scale. Errors don&apos;t go down with zooming, and as the chart is blown up errors get worse and may place your boat on shore when it is in the channel. Today NOAA is moving toward vector charts, where all relevant information is stored in digital form with far more accuracy than allowed in the raster process, and much faster computer access. Many major ports, in fact, are being resurveyed for vector charts, with extremely accurate locations for channels, piers, slips, mooring dolphins, bulkheads, and bridges. All these elements are placed with an accuracy of one meter or less, allowing ships to come in with almost zero visibility. Covering 40 major U.S. ports by 2003, vector charts will allow a pilot to slide a huge tanker right up to the dock in thick fog. It is truly a smart product, with a high degree of accuracy. And overzooming is not a problem with vector charts. Unfortunately for pleasure boaters, this level of accuracy will remain somewhat out of reach, as most of our cruising areas will be covered only by raster charts for many years to come. Vector charts currently on the market, such as those sold by Nobeltec, are not true vector charts like those described above. Rather, they are paper charts that have been put into vector format. This can mean much faster access to data and the ability to manipulate data, such as changing depth units, but it does not make the charts any more accurate than raster charts, and they are still subject to overzooming errors. A few notes on the accuracy of our charts. Hazards "reported" on charts are sometimes deceiving. Their positions are usually recorded during an emergency (such as a fire or sinking) or by eye-balling a location-often positioned to the nearest latitude and longitude on the chart. There are several thousand unsurveyed wrecks and obstructions marked on charts and many more that are still uncharted. Thus, when you are in the area of a reported hazard, keep up your vigilance for a considerable distance away from the mark on the chart. Also, since so many soundings are from lead line or single-beam data, there still may be potential dangers lurking below the surface. If you are cruising in an area with older sounding data that shows a very irregular bottom, it would be prudent to stay in the deepest, most commonly used channel rather than taking a shortcut. The bottom line is to be careful out there. We are still a long way from fully accurate bottom charting of all U.S. waters.